The National Archives and Records Administration and Wikimedia D.C., invite you to help us improve access to open government data on Wikipedia. 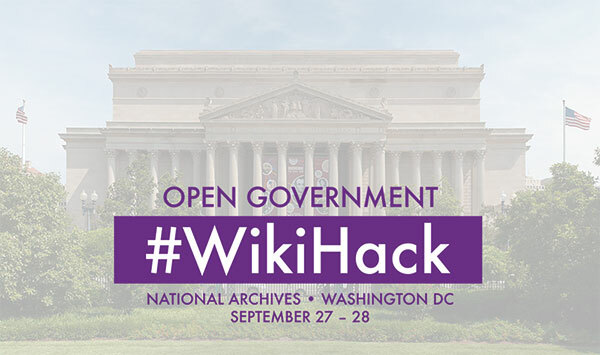 We are excited to announce that we will be hosting the Open Government #WikiHack, a two-day hackathon at the National Archives Building in downtown D.C., over the weekend of September 27 and 28. Did you know that Wikipedia articles with NARA digital images saw over 1 billion page views in FY13 alone? Have you heard about Wikipedia’s newest sister project, Wikidata? It serves as a source of structured open data that can be used to programmatically populate information in Wikipedia itself. Could your agency be better leveraging Wikimedia projects to improve public information and fulfill mission goals? All agencies, organizations, and individuals are welcome to come and pitch an original project idea, join a team, or just learn more about open government and Wikimedia. We will be joined by Wikipedians with expertise in wiki markup, MediaWiki, Wikidata, and community social norms, as well as National Archives staff familiar with NARA’s open datasets and APIs. All project ideas are welcome, and we look forward to collaborating! The event will include free lunch and refreshments generously provided by Wikimedia D.C., as well as a meetup at a local bar on the evening of Friday, September 26. If you have any questions, feel free to email Dominic McDevitt-Parks at NARA or James Hare at Wikimedia D.C. Capacity is limited, so please register via our Eventbrite page soon. You can also read Wikimedia D.C.’s announcement blog post. « Trends on Tuesday: Are only 11% of Websites Responsive?